In order to avoid a cluttered or unorganized look, pick a color palette and stick to it. For example, you could pick a cool-toned theme by incorporating blues and silvers. A warm tone would include reds and golds. 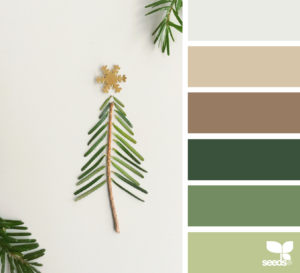 A natural color pallet could include lots of greenery and neutral tones, such as this palette by Design Seeds. Or you could keep it simple and stick with the traditional red and green. Whatever color palette you decide on, just be sure to be consistent with it. Christmas lights are definitely not just for the tree. 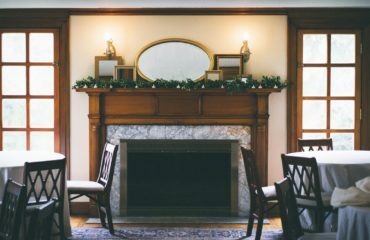 Whether it be string lights or candles (real or fake), incorporating lighting with your holiday mantle decor will balance out the light from your fireplace and create a cozier ambiance. 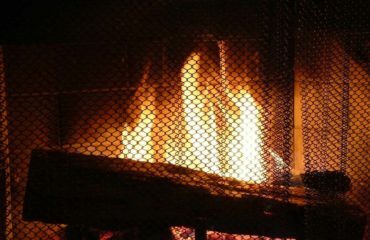 When your fireplace has gone out, you can safely keep some cozy lights on throughout the night. Including fresh holiday greenery, such as aromatic evergreen cuttings, will fill the room with the scent of winter and add color and life to your decor. 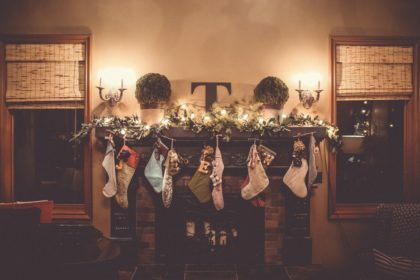 Some winter greenery and flowers we love include eucalyptus, holly, redwood, pine, fir, magnolia, mistletoe, amaryllis, and poinsettia. Even if you have a wide assortment of pieces to display, arranging them in a symmetrical pattern will automatically create an organized look. 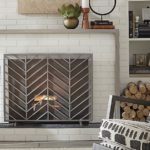 The decorative pieces don’t have to be exactly the same to create a balanced look, simply organize each side of the mantle so that they almost mirror each other, matching similar pieces of similar sizes. The holidays are the perfect time to show off the pieces you’ve had for many years or that were passed down to you. Whether it be your childhood stocking or your grandmother’s ornament collection, mix in vintage with newer decorations to add a sense of history, comfort, and maybe a little nostalgia to your holidays. 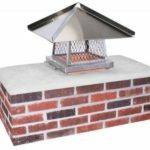 The Oregon Chimney Guys provide services to fulfill all your chimney needs in Albany as well as Corvallis, Eugene, Springfield, and surrounding areas. 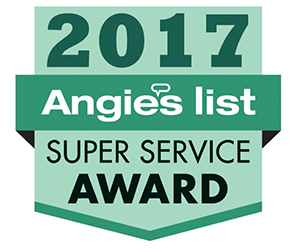 Contact us for more information on our services.